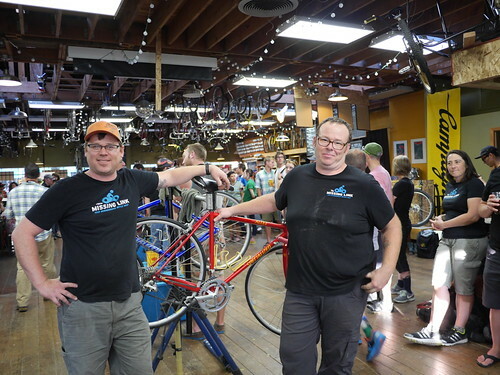 Missing Link Bike Shop mechanics James Emond and Matt Glynn emerged victorious as the winners of the 2nd Annual Bike Mechanic Challenge last Saturday at Velo Cult Bike Shop. They bested their competition, including last year’s returning champions, Bike Gallery, in four technical challenges to take the grand prize of an engraved “Lefty Accidentally” Right Arm Repair Clamp from Efficient Velo Tools. “We have done this two years in a row and it is extremely fun for us. We look forward to doing it again. Of course, it was really fun winning,” noted James Emond after Missing Link took the lead. The whole evening was a fundraiser for the Community Cycling Center, but was more broadly focused on showcasing the skills of bike mechanics that are a vital part of Portland’s bicycle ecosystem. In addition to encouraging a bit of friendly competition among local shops, the Bike Mechanic Challenge celebrates the people that keep everyone in Portland rolling. 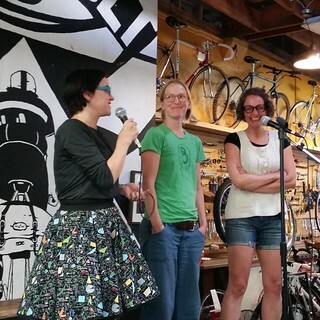 Our MCs, Natalie Ramsland of Sweetpea Bicycles and Leah Benson of Gladys Bikes, discussed the importance of mechanics’ “bikeside manner” as well as technical skills. A packed crowd heckled, rang cowbells, and cheered while the competing mechanics sped through all four challenges: repairing a flat tire, changing brake cables, taping handlebars (with the surprise twist of tying two mechanics together by their hands! ), and rebuilding a children’s coaster hub. The shops competed to be the first to finish with all hands off the bike, all tools on the bench, and their shop rag held in the air. Once they finished each challenge, a team of impartial veteran mechanics judged the technical skills, presentation, and congeniality of each team. In round 3, Islabikes received bonus “niceness” points for lending an extra wire cutter to the Gladys Bikes team when theirs proved to be faulty. A highlight of the evening was Brett Flemming from Efficient Velo Tools showing off his skills from 35 years of bicycle industry experience, including 15 years as Service Manager for Bike Gallery. After all seven shops had completed the final mystery challenge – assembling a children’s coaster hub (something Holiday Bike Drive volunteers know well) – Brett got up on stage to do the task alone while blindfolded with Survivor’s “Eye of the Tiger” playing in the background. He completed the task in just over 8 minutes by using touch, smell, and sound. Thank you to the talented mechanics that came out to compete from local bike shops Missing Link, Bike Gallery, Gladys Bikes, Cyclone Bicycle Supply, Western Bike Works, Bike Farm, and Islabikes. A very special thanks to our lead sponsor, Cyclone Bicycle Supply, and to the rest of our generous sponsors – Western Bike Works, Efficient Velo Tools, Po Campo Bags, Portland Design Works. Finally, special thanks to our fabulous host, Velo Cult Bike Shop. Together, we raised over $9,000 for our work of broadening access to bicycling and its benefits. Thank you to everyone for your support! See you next time.